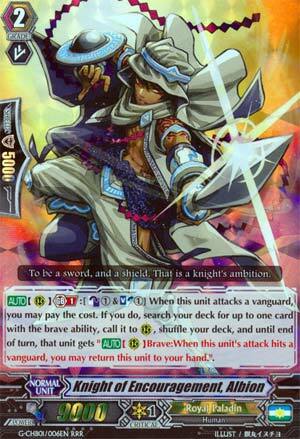 This or Knight of Twin Sword? Why not both? They can loop into more attacks, right? Albion's GB1 Soulblasts and Counterblasts 1 on attack to call a unit from the deck with Brave, and the called unit gains a skill: if it hits the Vanguard, it bounces to the hand. Okay in all seriousness, I don't think this should be run to replace Twin Sword or together with Twin Sword. The better Brave support like new Igraine NEEDS that soul, and so do your better G-Units like Transcending Altmile, and you won't always have Altmile's personal Critical or the new Perfect Guard Regius to recoup it. That being said, he could have relevance in decks outside Altmile, who don't spend too much soul for anything else, since he calls stuff of ANY Grade as long as it's got Brave, like Sanctuary Guard for quick and easy boosters, since he doesn't need an Altmile Vanguard to proc. And lacking Brave, he's easy to use whenever. Bizarrely, more useful for stuff not specialising in Brave due to redundancy, but not awful. Knight of Twin Sword replacement? Kind of. You'll have to manage your soul to use him, which isn't the hardest of tasks. He does encroach on your other plays that use the soul, but he doesn't need to be boosted, which is great. He bestows an on-hit bounce effect to the unit he calls, but that's relevant mostly in the Mid Game only, where the opponent might not feel like guarding the unit so they can have damage of their own to counterblast. Realistically, other Royal Pal decks are gonna keep their Twin Swords, but there's enough Brave units in Altmile.dek that you'll wanna run 2 or 3 copies of himself. Too bad he doesn't have the Brave keyword himself, but that's probably asking for too much.